When the EOS 5D Mark II came onto the scene in 2008, I don’t think anyone could have known quite how big an impact it would have. Here we are, over four years later: in an industry that is continually shifting towards smaller cameras; where the standards are set incredibly high for image quality, features, and camera design; where the tools available to feature films in Hollywood are the same tools used by documentarians, independent filmmakers, and students all over the world. Right in the middle of this mix enters the Canon Cinema EOS line, the natural progression of a camera company that once changed the industry so radically. The Canon C300 was the first of this line introduced to the world, and for all intents and purposes is the vehicle around which it is built. I bought a Canon EOS 5D Mark II about three months after it had come out, and have been using it as my main camera ever since, so I’m already pretty disposed towards the brand. I’m a big fan of getting stuff done “in camera”, and the Canon EOS image consistently impresses me with just how good it looks right off the bat. The monitor module can rotate and let you view from pretty much any angle. I am also a video engineer and professional. I have worked ENG, press-conferences, live sports, sitcoms, and everything in-between, on all major (and minor) makes and models of cameras. I can argue the merits of most any camera with you ad nauseam. For this review, I am putting on many hats, and I will try to not let one hat get bigger than the other. Canon Professional Services very graciously provided us with a press review loaner of this camera not once, but twice, as the first camera I received had a hardware issue. During my period of testing, I attempted to put it into as many situations as I could, while keeping myself as impartial as possible. I shot footage at a concert in a very dark venue, on-location during a race in broad daylight, two short films, and travelled with it across three states. 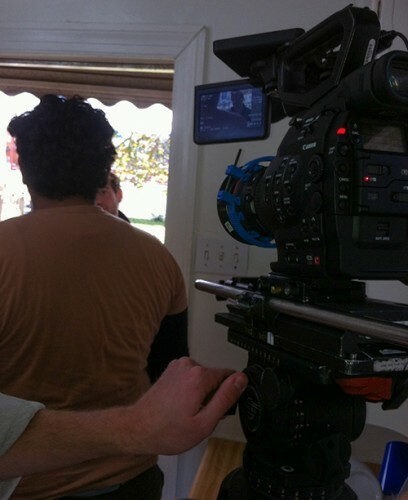 I put it on a Jimmy Jib, Glidecam X-22, handheld, and even attached it to the outside of a car. So after three months off and on with this camera, let me tell you what I’ve found. 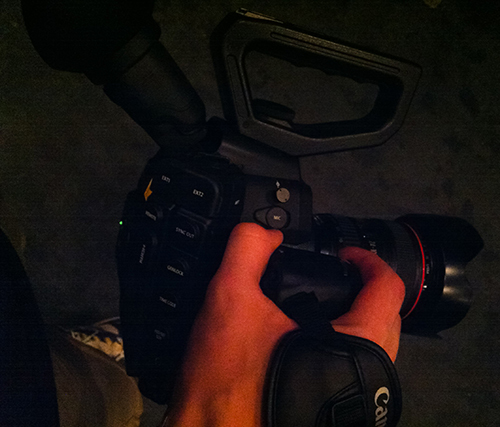 The C300 is incredibly well-balanced, and feels almost like a regular DSLR when in normal handheld mode. Even adding the monitor module doesn’t affect the balance much. 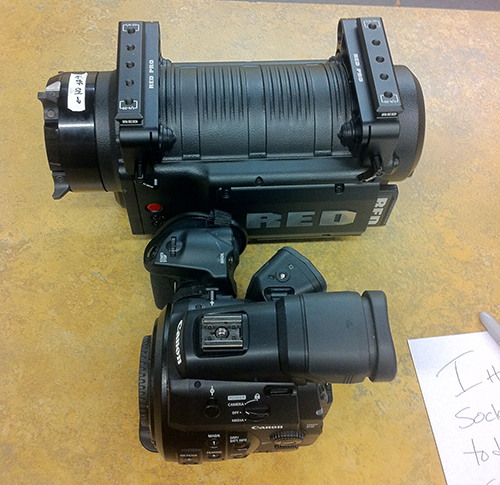 The camera is well laid out, with easy to access controls on the left side, and is ready to shoot right out of the box. The included grip unit screws easily onto the side, and really makes the camera feel like a Canon DSLR, but with just enough heft to make it seem like you’re carrying an actual ENG camera. The form factor leans toward the DSLR without a shoulder mount, but the rotating grip lends itself to much more of an EX3 feel. In fact, the C300 feels much better than an EX3 in terms of balance and weight. The attachable monitor module gives you an extra set of customizable buttons, as well as a better set of menu buttons and playback controls. The cables are a little bit of a pain sometimes—I would rather they had used some kind of coiled cable to prevent kinks. Physical setup of the camera is very intuitive, and my instincts tell me it will make sense not only to Canon users, but anyone who is familiar with video camera construction. The major complaint I have is that the default menu structure is very confusing: the important stuff (bitrate, frame-rate options, etc.) is buried in the “Other Functions” menu. Fortunately, Canon provides a workaround for this problem by making the first menu a customizable “My Menu.” Within a few minutes, any user can personalize a set of easily accessible options. Any buttons with numbers on them can be customized, but all come with default options that cater to professional shooters. It took me maybe twenty minutes to figure out where everything was, and immediately I was ready to start shooting. For the two shoots I in which I used a separate operator, both figured out the camera pretty immediately. Canon’s C-LOG gamma produces a very flat image, but lets you pull a lot of information out of the “negative.” It’s not RAW, but is a lot less of a hassle. The C300 has a maximum framerate of 29.97p (1080) and 59.94p (720), with all the options in between (23.98p as well as a True 24 option.) There are a number of reasons for this, not least among them being the amount of power you need to run 3G HD-SDI (for anything over thirty frames at full HD), and for that you’d need the Canon C500 with an external recorder (the camera is currently listed at $26,000 on B&H, with an external recorder costing a couple thousand more.) The Canon XF codec is a pretty good one, and there are several different sizes of compression—I shot everything at 50 Mbps, which gives you 45ish minutes on a 16GB card. Codecs are not my specialty, but I’m sure an in-depth discussion can be found elsewhere online. The camera has several picture profiles, most of which are very customizable. The selling point for Canon is their “C-log gamma”, which flattens the image a lot—not as much as Sony’s S-log, but it does not cost an extra two grand, either. The EOS Standard look is also available. I flipped back and forth between the two, and was happy with both images. The C-log looks very filmic, and gives a lot of room for color correction in post, while the EOS Standard is the same profile as my 5D, and looks very good. This camera is a low-light monster. Canon spells it out with science, but basically they have a 4K chip downsampled to full HD, which lets more power go to the sensor without creating any additional noise or grain. The short film I shot had a scene that was lit at night with only 4 HMI’s (not much, considering the space) and I never went below ISO 4000 . . . yet there is no grain. 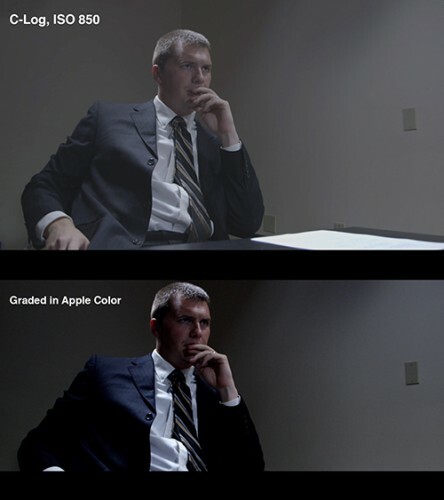 Grain only becomes noticeable above 12,000, though even ISO 20,000 is still useable. While the ISO performance is the headliner, the opening acts are very noteworthy, as well. Right out of the box, the C300 has the same beautiful image as a digital SLR, but fewer artifacts and greater dynamic range. Thanks to these improvements, editors can get an amazing amount of information out of a scene using the C-log gamma curve. MAJOR COMPLAINT, though, and one to note for anyone coming from DSLR shooting: there is NOT a built-in microphone. It seems like a small thing, but I’m used to having some kind of reference audio from almost any of the cameras I’ve used, and here I had none. There are a variety of configurations for run-and-gun shooters, and as long as you know up front you can put a small shotgun or something somewhere in the chain, but I still wish Canon had taken the internal mic from a DSLR and dropped it in somewhere. Not the best audio, no, but good enough to catch the clapper! The ¼” connection on the body isn’t listed as an input on the Canon website, so I have no idea if it has any preamp connection. I didn’t test the audio on this camera versus any other, but this is a professional camcorder: it has external controls for the audio, and level meters on-screen. None of the problems with DSLR audio control will be had here. The RED One-MX next to the C300. The game is constantly changing in the camera world these days, with new camera models coming out at a much faster rate than ever before. Where the C300 sits is lower in the professional range, at $15,000 from most retailers, with many of the professional camcorder features (ND filters built-in, XLR audio, large bitrates, etc.) but the ergonomics and attitude of a digital SLR. 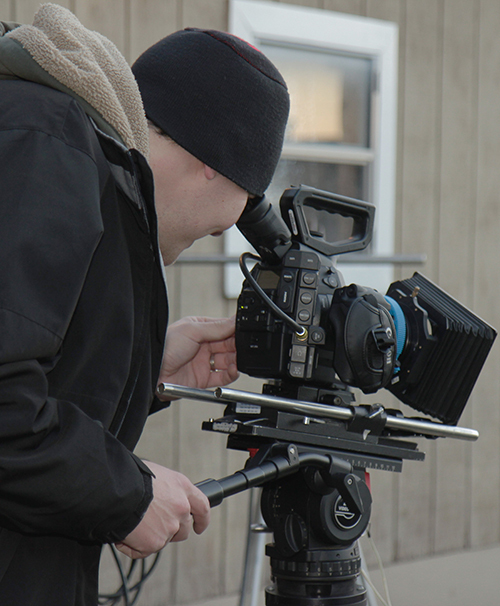 However, the standard EF mount (a cinema PL-mount is also available) means that someone with a pre-existing Canon setup can buy the camera body and use all the current lenses, media, and rigs (with slight modifications), so there are no hidden costs or future upgrades required for functionality (like a Scarlet or an FS700.) While the price may drop in the near future, with Sony putting out a camera every couple of months (seemingly) and RED dropping their prices so far, the image, flexibility, and low-light performance are worth it if you can swing it. If the $15K purchase price tag won’t fit into your sub-$50K microbudget, the rental options are still pretty competitive. I was floored by the C300. This camera is a dream to shoot with and hold. It’s a very natural progression from any one of Canon’s digital SLRs, and holds its own against all of the other manufacturers, especially with the low-light performance (in conjunction with Canon’s excellent lens Image Stabilization). I highly recommend it. Lee Clements is a filmmaker, videographer, and editor living in Virginia, his trusty 5D Mark II always by his side ready to capture some new bit to include in a future project!